The 15cm wide, white, fragrant flowers emerge before leaf break. Stunning when in bloom. Habit becomes more open, spreading and horizontal with age. Native to central China. 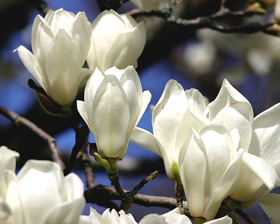 Magnolia Juliana has a medium to fast growth rate. It grows up to 6m in height. Prefers sun or partial shade and moist, well-drained soil. Germination: Can be sown outdoors in the fall for spring germination. Keep moist, mulch the seed bed.